After the first viewing of SITE Santa Fe’s biennale exhibition: The Dissolve, I am happy to report that I enjoyed experiencing the videos and the space. There are a couple things worth mentioning. One is that, while the term dissolve in film is usually a transitional effect, where one image dissolves away, into the next one, this show itself does not transition from paintings to photographs, and then to animation and videos. Instead the show starts by presenting all videos. This could mean that I, the viewer, will dissolve my preconceived notions of placing video into a box! So into the box I went! Enough of the pieces could be considered rather painterly, or depicting dissolving medium, like sand, charcoal, smoke, mist, or ephemeral marks of water brushed onto a stone surface. And there are a few stop frame, or still, one shot pieces, or screen tests, using techniques dealing with frame, focus, and light, to recall the photographic process. 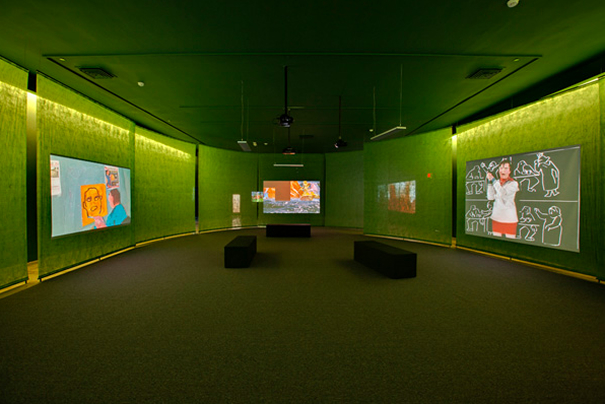 The museum/gallery space was divided into two main sections, one with more installation designated spaces, and one more open, with two semi-transparent thin curving interior walls, containing more consistently sized video screens. In the first space (I went through counter clockwise) there were examples of how I am used to experiencing videos in a museum/gallery, each piece trying to be isolated as its own installation. There was a piece with articulating little cameras, hovering above a little rotating model world with shocking events, like the aftermath of someone being hit by a car, and projected into a format that resembled a television. This artwork looked interactive, but was not interactive, the gallery attendant informed me. Also in this section, there was a video game inspired work, and I felt like I maybe understood it, but I found little to engage with, it wasn’t clear to me if it was commentary on how all games incorporate a degree of art, or if brightly colored pixels glimmering from far away in decorative little frames draw you in, and then the game is about the parts of society involving drugs, murder, and crime? My quest for the perfect video game/art continues on. The second space seemed more like a shared space, built around somewhat uniform video screens. I did consider this space more thought out in regards to path, not being able to get a clear sense of direction, and hiding the way to the next space promoted lingering, pausing, and viewing! This communal/community space, strengthened the desire to slow down, with the opportunity to watch more than one screen at a time, through semitransparent divisions, and allowing us to see each other in the dimly lit, mostly by video screens, museum. Allow me to digress here: In our cities, or towns, we have this big machine happening, societies and premiers and cultures mixing, and for some, the pleasure of going to the commercial, large multiplex, where people get crowded together in stadium seating, gazing at a large wide format screen, big sound, and 3d glasses gives the larger studio films a way to convince the viewer they are watching something that excites, titillates, and informs. This works both ways, and depending on who you consider “they” to be in the last sentence, reveals your understanding of the sensational methods, and the fuel that cycles the large studios to entertain. Okay, it’s not a total digression, because I am thinking about how one could show something really fresh if they did not rely purely on these methods. Deviation may be one of the fastest ways to enter a new box, so please, keep going all the way out of the boxes. From an artistic end, are there video artists who want to participate in that same format? It seems more artists are likely to express themselves through lower fi productions on youtube, as it is more accessible and is free to distribute to a wide audience. I suppose there are some artists who have gone into the film industry who probably don’t end up coming around to creating art, while addressing methods used in the industry. I recently downloaded Tetro on iTunes, and watched it on my 15″ led display at home. A discrace I am, but this is what happens, and I think Tetro is a good example of a film made up of people who are sensitive and respect art in real life, who have made it a career, but then also put their talent to good use, with their own visions, as often as possible. David Lynch is another artist/filmmaker who comes to mind. Perhaps artists reject the traditional methods, rolling into current methods of digital creation. If that were the case, I could agree in that the model has proven a failure, mainly by only furthering the dominant culture and not providing enough variety. As an aside to this, I will recount my first memory of being in a multiplex. My first movie experience in a theater, that I can remember, was a re-release of Disney’s Pinocchio. I was very young, I cried in the middle and the movie freaked me out. We didn’t stay for the rest. I have not watched the movie since. So when I hear about something dissolving, I think that the old will fall away to something new, outside of the language we already know. The show represented some very talented artists and their work. Some of the work recalls the roots of animation, and this inspires me to go back, and find inherent qualities of the medium and reinvent video so that I can enter the movie, interact with the characters, and help save Pinocchio from curses, cages, and being held up by strings, and put my childhood trauma to rest.